One thing is for certain, we agree to disagree. Or maybe I’m just more in tune with my car as I can definitely feel when weight is reduced in the car. Specifically when I changed to a lightweight battery and went with tires that shed 3 - 4 lbs/corner I could feel the difference in the cars handling and over the road characteristics. It’s even more pronounced when I’m below half a tank of gas, the car just feels different. Also keep in mind that I’m referring to the 987 Spyder, not the 981. The 987 Spyder lost a solid 140 lbs of weight. ...............There's also a small chance I may end up with a 981 Spyder (manual top be damned) if they get clobbered too much when the 718 Spyder shows up. The hunt is half the fun. Agreed; we're all enthusiasts with minor, specific preferences. Such differences make the world interesting! Since the manual top bothers you, should stay away from Spyder. You may end up keeping for good, whatever you are getting (S/GTS) since there'll never be another NA in a Boxster, other than Spyder (possibly post-982). So, it is important to get that is nearly perfect (to you) in every way. Then why not unbolt the passenger seat and leave it and the top in the garage. Wt? A good 100 lbs? Finally, 1/4 - 1/2 tank of gas and BAMM! Would love to do a kind of outlaw Spyder. Would also remove the side window glass, swap in some carbon fiber clubsport door cards, clubsport hood, and gt3rs exhaust. I keep wondering if a company like Singer is going to come along and do to the Boxster what they've done to the 911.
retro boxster with 1997 parts? I'm not very knowledgeable about Singer, but I do know their whole thing is about a "re-imagined" 911, so why not a "re-imagined" Boxster? Do as Singer does and use carbon fibre body panels and other weight-savings features. De-lux the interior in some ways to reduce weight, and then totally re-do with the finest materials you can find. Think 550 Spyder in its interior simplicity, but with tremendous craftsmanship with regard to seats, gauges, steering wheel, shifter, etc. Relocate the fuel filler to the center of the hood like on the Spyders of old, just as Singer does. Come up with a top that is 987-like in its genius and rip out all the electric motors, sound deading, etc. Maybe make it single seat or have the ability to easily "clip out" the passenger seat when doing solo canyon runs (have no clue if this is feasible w/airbag regs). Then have a tonneau covering the passenger side. Drill everything for lightness - pedals, keys, whatever. Make everything to a very high standard. Totally bespoke. Use all the great Spyders from the past as design inspirations but have the cars be totally modern. Heavily modify the engine. Have it redline to God-knows-what. I'm a weight freak so for me a much lighter weight Boxster has tremendous appeal and there is so much that can be done to trim the weight of the Boxster, which Porsche will just never do -- unfortunately. Just some ideas. Some crazy perhaps. If Singer "re-imagined" both 911's and Boxsters, you know which one I would pick! Exactly! For $10-$12K you can have your pick of a zillion 986 Boxsters these days. ****** 'em up and use them as your base car, just as Singer uses the 964. You're going to totally redo the car anyway so no need for more expensive 987 or 981 gens. The 986 would be a great, cheap base from which to start. It's no less crazy an idea than when Dickinson started his gig. In fact, just follow the Singer formula that's already been established, but tweak it for the Boxster application. Why is all the outlaw and resto-mod focus and fun centered on the 911, particularly when it was the dragon slaying Spyders that put Porsche on the motorsport map? I get that the 911 is the halo car and has been around much longer than the Boxster, which debuted in the late '90's, but so what. 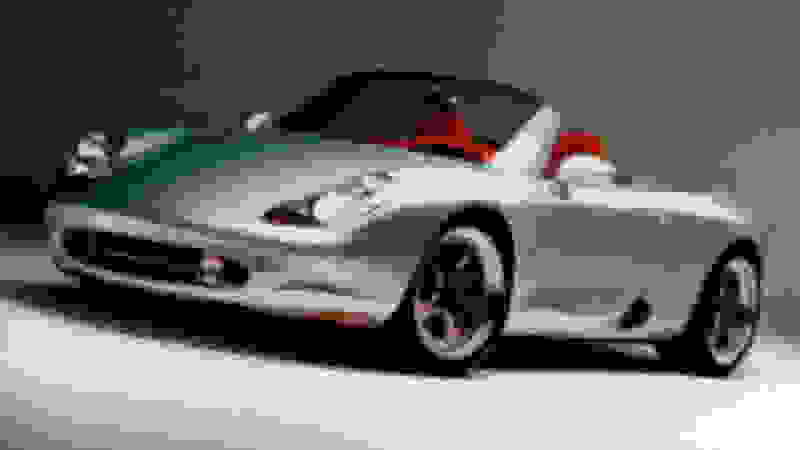 I view the Boxster as a much more exciting platform from which to start a "re-imagined" Porsche than a 911. And if there is sufficient demand for an auto-top, as hf1 assures us is the case, then offer that as an option. Two models: LWS (light-weight special - more distilled to its essence) and GT (grand touring -- more lux and auto). I like. Great concept from you gents. singers philosophy is that they good the best from every generation thus far, while adding their own twist. someone is starting to do this with the 356es. A top could be manual, light, AND convenient, like the new Miata’s. Can’t believe I’ve been promoted to the flagbearer for porkiness after writing hundreds of posts about Porsche needing to focus more on adding lightness (instead of HP) in their new models. Brilliant idea Nick. They're plentiful, cheap, some still w low miles etc... and with pulling out the extra seat, the top, and retro fitting a CF back lid with a single streamer (for example), wheels, etc... you could have a bada## boxster bandito. Hmmm... shall we? Great ideas! I would be down for a light weight, all-manual-affair, elegant with cutting edge handling open-top (no-top). However, as with anything Singer, you would be looking at a price point that would make a 991 Speedster a bargain! Granted, it would be a completely ride. I suspect Singer single-handedly created the retro-but-cutting-edge 911s. There have been boutique players spinning off very small volume massive-personalization models. But, Singer took it to a different paradigm. So, I'm sure they can pull this off; and, the market exists for the right representation of cool-to-be-motoring rides!